Welcome to our booth at Taipei International Bakery Show 2019 and give advice. Welcome to our booth at Gulfood Manufacturing 2018 and give advice. Go hurry and join us at IBA Munich Show. Welcome to our booth at FOODTECH TAIPEI 2018 and give advice. Can’t wait to meet you in IBA Munich, Our booth number is A1 424, we have new product launch, are you interested? Can’t wait to meet you in Bakery China,Our booth number is W2C61, we have new product launch, are you interested? Go hurry and join us at Singapore expo! ???? ???? ???? ???? ???? ???? Can’t wait to meet you in FHA Singapore, Asia’s most comprehensive international food & hospitality trade event. Our booth number is 4L2-14, we have new product launch, are you interested? Welcome to our booth at Taipei International Bakery Show 2018 and give advice. 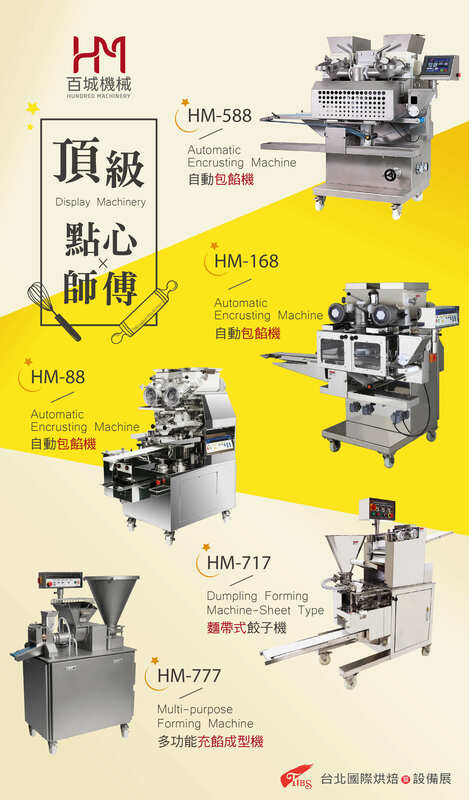 Hundred Machinery will held a presentation for making Open Top Pizza, Donuts, 4 Color Mochi, Waffle, Siaolonbao, Shrimp Bao…etc by reconditioned Rheon KN500, KN400 and AN208. Two types of machines will be displayed at international foodtech India, one is HM-168 Auto Encrusting Machine and the other is HM-737 Auto Samosa Forming machine. Sincerely welcome to our booth at Hall 1, E45 HALL 1, Bombay Exhibition Center, Mambai and give advice. Welcome to our booth at Foodtech & Pharmatech TAIPEI 2016 and give advice. Welcome to our booth at China International Bakery Show 2016 and give advice. Welcome to our booth at FHC China 2015 and give advice. Welcome to our booth at 2015 Gulfood Manufacturing and give advice. Welcome to our booth at "Foodtech&Pharmatech Taipei 2015" and give advice. Welcome to our booth at IBA 2015 and give advice. Welcome to our booth at NAR SHOW 2015 and give advice. 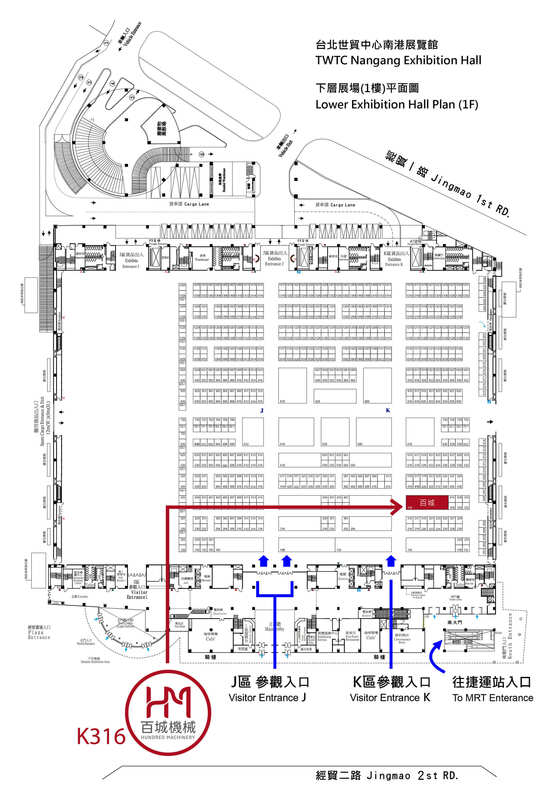 Welcome to our booth at Taipei International Bakery Show 2014 and give advice. We cordially invite you to visit our booth at Gulfood Manufacturing Connexions 2014 and give advice. 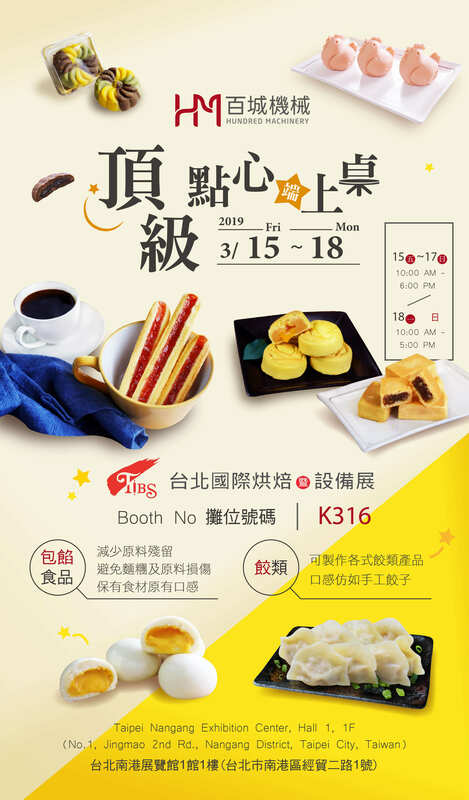 Welcome to our booth at 2014 Taiwan Int'l Hotel Restaurant and Catering Showand give advice. Welcome to our booth at Interpack 2014 Dusseldorf and give advice. Welcome to our booth at Food & Hotel Asia Singapore and give advice. Welcome to our booth at Taipei International Bakery Show 2013 and give advice. Welcome to our booth at "Russia Agropromash 2013" and give advice. Welcome to our booth at "2013 Russia Agropromash " and give advice. Welcome to our booth at "2013 IBIE International Baking Industry Exposition " and give advice. Welcome to our booth at "Fine Food Australia 2013" and give advice. Welcome to our booth at "Foodtech&Pharmatech Taipei 2013" and give advice. Welcome to our booth at 15th HOFEX show in Hong Kong 2013 and give advice. Link: HOFEX- the region's leading food and hospitality tradeshow will return on 7-10 May 2013 at the Hong Kong Convention and Exhibition Centre. In its 15th edition, HOFEX 2013 continues to blend the best of Food and Beverages, Equipment, Supplies, Services and Hospitality Technologies. We are so sorry that our account at Alibaba.com (http://hmfoodmachinery.en.alibaba.com/) has been embezzled during Chinese Lunar New Year vacation. Right now we are resetting our account for solving this issue, as our website at www.hmfood.com and www.hmfoodmachinery.com you could find that we are the manufacturer for food machinery not for selling i-Phone and other mobile phone, so please don’t remit the payment to the website you visited, thank you very much. Thank you for visiting our booth at The 13th International Food, Pharma, Cosmetic Processing & Packaging Exhibition 2012 and gave advice.